Two competing companies — Suntech Power and Hanwha Solar — have joined forces with the University of New South Wales in Australia under the banner of a collaborative research agreement to better understand a new processing technology being pioneers by the university whereby tiny metal contact regions can be “self-patterned” into a solar cell’s electric insulator. “Currently closely-spaced small-area metal contact regions in an insulating layer can only be formed by deliberately patterning the holes with a laser scanning over the surface, which is quite slow,” says Dr Alison Lennon, a senior lecturer from the School of Photovoltaics and Renewable Energy Engineering (SPREE). Lennon and her PhD students are investigating a new approach to automate and speed up the patterning using aluminium anodisation, an already well-understood process by which a chemical coating is formed on a metal surface to protect against corrosion. Using this technique, the UNSW team have made prototypes, and they are now working on understanding how the metal contacts form so that they can improve the efficiency of each cell, and how to refine the technique so it can work on a larger, competitive industrial scale. “We need to make the process robust, with predictable high efficiencies for manufacturers, and we need to make it cost-effective,” says Lennon. Lennon, who helped broker the collaborative research agreement, says this is an example of two companies realising they can achieve more as partners than as competitors, and says their support could open the door for faster commercialisation. 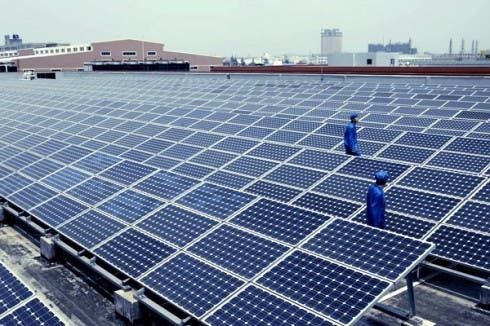 “Both Hanwha and Suntech operate high-volume solar manufacturing plants, and both are within the top 10 silicon solar cell manufacturers in the world. So if we can demonstrate the viability of this technology, we are both in a position to move the technology into manufacture relatively quickly,” noted Dr Paul Basore and Dr Renate Egan, the Advanced R&D Directors for Hanwha Solar and Suntech Power, respectively.